Leading power supply manufacturer Huntkey is launching a new line of power strips that are ideal for charging portable USB electronics such as smart phones, tablets and mobile devices. With the average person owning an increasing number of electronic devices, power strips are becoming increasingly useful however those designed specifically for use with mobile devices are difficult to find. The launch of these new and colorful Huntkey power strips are specially designed with the use of mobile devices, tablets and PCs. As these devices are a part of everyday life, Huntkey has developed the SMD407 with dual 5v 2.1A USB plugs, providing the users with premium power protection for their devices. 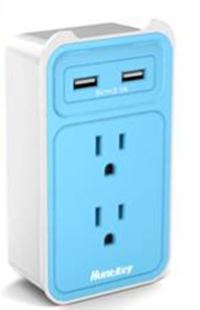 This will aid in decluttering and saving space while protecting, charging and powering everyday electronics. The Huntkey SMD407 is ideal for small home appliances, general household electronics, computers and printers, blending in seamlessly with today's modern electronics and appliances, while offering a splash of color. As a professional manufacturer, Huntkey's USB power strips are colorful, more efficient, secure and space saving. These are the key interests of young professionals looking at upgrading their power strips in today's market place. The Huntkey SMD 407 will be available in Philippines later this year.